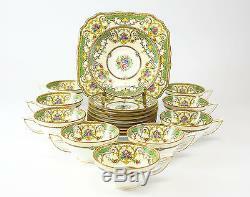 Description: 18pc +1 Minton Tea Cup and Saucer Kenora Set with Cake Plate. Hand Colored with Raised Enamel Detail. This set comes with 9 cups and saucers plus one cake plate. Features Ornate Floral and Garland design. Tea Cup; 4 Diameter, 2 Height, Saucer 5.5 Diameter; Cake Plate 8.5x8.5. No signs of cracks or chips. Please view our selection of quality items. For sale at Gallery XV! (This item is located in Gardena, CA). Domestic & International Customers - WELCOME! We guarantee the authenticity of all items to be as represented. We make a best effort to provide a fair and descriptive condition report. Gallery XV specializes in a variety of art, antiques, jewelry and collectibles. We possess over 100 years of experience in the industry as collectors, appraisers and resellers. The item "18pc +1 Minton Tea Cup and Saucer Kenora Set with Cake Plate Hand Colored" is in sale since Thursday, September 11, 2014. This item is in the category "Pottery & Glass\Pottery & China\China & Dinnerware\Minton". The seller is "gallery_xv" and is located in Gardena, California. This item can be shipped worldwide.